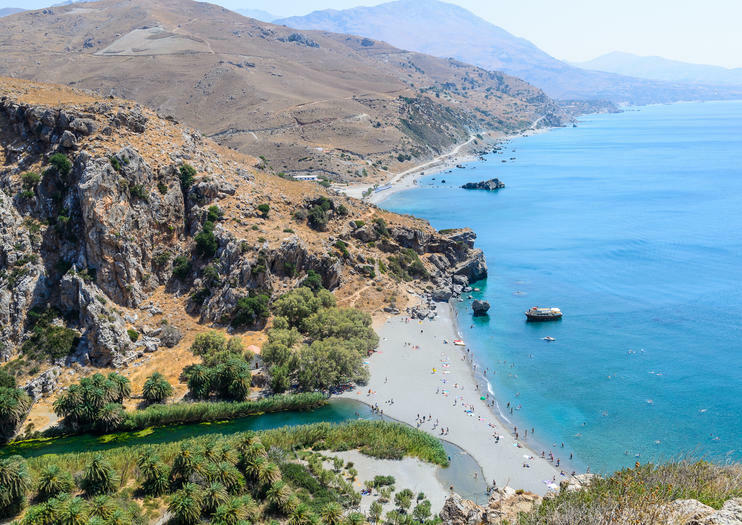 Arguably Crete’s most beautiful beach, Preveli Palm Beach claims an enviable location, stretching across the mouth of the Kourtaliotiko Gorge, overlooked by towering limestone cliffs and fringed by lush palm forest. The remote beach is unique in that it fronts both the freshwater lagoon of the Kourtaliotis River and the Libyan Sea coast, with a sliver of golden sand separating the two. A hugely popular spot during the summer months, Preveli’s sheltered waters are ideal for swimming, but there are also ample opportunities for hiking, boating or canoeing along the gorge, exploring the nearby waterfalls and caves, or trekking to the hilltop Preveli Monastery. Preveli Palm Beach is located at the edge of the Kourtaliotiko Gorge on the south coast of Crete, about 43 km from Rethymnon. Get off the beaten path on Crete during this full-day 4x4 adventure exploring the island’s charming villages, deserted beaches and rugged scenery. Climb into an off-road Land Rover as you explore idyllic small towns like Spili, marvel at natural landmarks like Patsos Gorge, and take a dip on postcard-perfect beaches like Preveli. A traditional Cretan lunch with unlimited wine is also covered. Explore Crete on an all-day off-road tour with a personal driver. After a convenient pickup from select hotels, hop in a 4x4 and get off the beaten path with an informative private guide. Visit otherwise inaccessible parts of the island, take a refreshing swim at the famed Preveli Beach, and enjoy a delicious lunch included in the tour price. Explore the rugged countryside of southern Crete on a full-day 4x4 adventure. Settle inside a 4x4 and rumble by olive groves, vineyards, and traditional villages to Preveli Beach, where a lagoon and sands meet the Libyan Sea. After lunch at a beach taverna, enjoy time to relax and swim before heading off road into Kourtaliotiko Gorge, known for its waterfalls and steep cliffs. Includes hotel pickup and drop-off in Rethymno area resorts. South Trip Special This excursion begins with the traditional village of Spili. Here you will have enough time to explore the village and have a look at the Venetian fountain ‘kefalovrissi’ with 19 lion heads. Passing through the extravagant scenery of the Kroutaliotiko Gorge you reach the Preveli Monastery. After Preveli Monastery the next stop is the Palm Beach of Preveli. From the top you will see one of the most breathtaking views of the blue waters combined with the lagoon and palm forest. You then continue to walk down the steps where you will end up on the best and palm forest. Here you will have about 2 hours of free time to soak it all in before continuing to Damnoni. The boat will take you from Preveli to Damnoni where you will have a break for lunch or refreshments. Damnoni is also an amazingly beautiful place and has an organized beach. When this incredible excursion ends you will be taken back to your Hotel area.